The apps have for sure amasses a considerable portion of the mobile app industry and with an unprecedented spurt in the number of apps available in the Google Play Store and App Store, the role of apps are going to impact the tech industry for sure. In a recent research report published by Sensor Tower’s, an app store intelligence firm, the increase in consumer spending in mobile apps have set new benchmarks and with the current pace, it’s expected to bring more business in the mobile app development. The report states that spending by users in the Apple App Store and Google Play mobile apps will grow by 120 percent by 2023, it will reach $156 billion. As per the current estimations, both the app stores are expected to double their revenue in the next five years. If we talk exclusively about Apple App Store, the consumers will spend $96 billion by 2023 in the App Store, and it will be a jump of about 104 percent over $47 billion that was recorded in 2018. And if the two mobile app store revenue is taken into consideration, Apple will alone account for about 62 percent of all revenue generated. 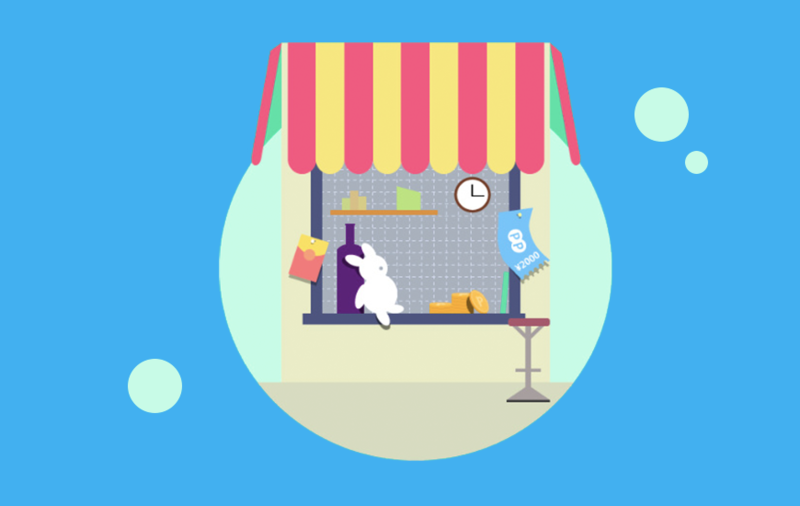 For the Google Play Store, consumer spending is expected to grow by 140 percent over the previous year and will reach $60 billion. Interestingly, Sensor Tower estimation falls a bit short of what App Annie, an app analytics and market data platform have proposed for the same time frame. 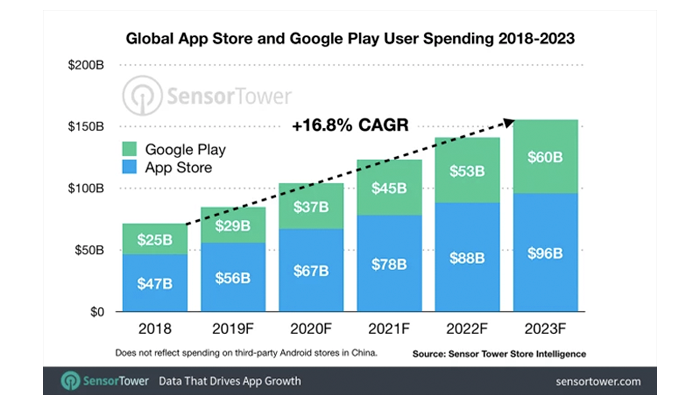 According to App Annie, iOS and Android apps have combined amassed $76 billion in consumer spending last year, which is an increase of 4 billion from what Sensor Tower has proposed. The change in the numbers between the two firms are due to multiple factors like App Annie compiled its data before year-end and after that, it revealed the figure of $101 billion in consumer spending in 2018 among App Store, Google Play, and third-party Chinese app stores. The other reason cited over here is that Sensor Tower doesn’t take third-party mobile app store revenue into account. Sensor Tower also came up with an exclusive report which covered the projected growth for the emerging markets like Africa and Latin America. In the next five years, Africa is expected to grow by 296 percent and will hit the $420 million mark on the App Store. For Latin America, the growth percentage is stated to be 239, which makes it $2.4 billion in revenue. 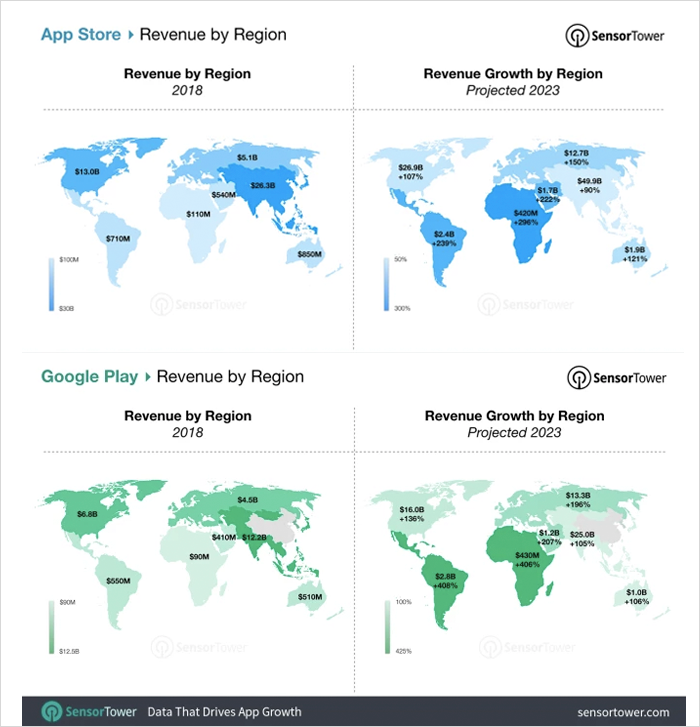 Latin America and Africa’s revenue growth in the Google Play Store is even projected to go further. Latin America will grab $2.8 billion by 2023 and as compared to 2018 data, it will be a jump of 408 percent. On the other hand, Africa will make the growth of 296 percent and will reach $430 million in revenue.